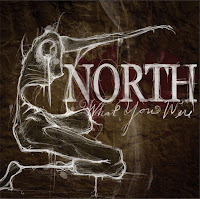 Having heard North described as post-rock in the vein of Pelican and Isis, I was not prepared for what I heard when I first gave their latest album, "What You Were," its first spin. Where Pelican could be described as more melodic and spacey with heavy undertones, North's latest release is very much the opposite - heavy with melodic undertones. Musically, "What You Were" does remind me very much of Pelican's recent "City Of Echoes" at times, only a little heavier with lots of added distortion and heavy, reverberating bass lines. By all accounts, the differences might have stopped there, but this instrumental band decided to feature vocals throughout the album, courtesy of Kyle Hardy and guest vocals by Rob Smith of HeavyHeavyLowLow. After adding these guttural growls of despair as vocals, the end result is considerably heavier than their previously mentioned post-rock contemporaries, however. The shock I felt came shortly into the second track, "Ghosts Among Us," following a brief, spacey intro. "Ghosts Among Us" starts out innocently enough, with a clean guitar intro for nearly a minute before the heaviness kicks in with added guitar distortion and the vocals, which could be roughly described as a distorted growl. Most of the album follows suit, continuing with heavy, distorted mid-paced songs, with a couple of clean, spacey tracks to break up the monotony. Unlike many other mid-paced, heavy albums, "What You Were" does not seem to tire. The droning pace is perfect for the style of music, and while some of the songs tend to blend together, the band throws in just enough tempo changes, clean guitars, and vocal variations to keep things interesting. "Falling In Perpetuum" stands out as one of the better tracks. In addition to the heavy distortion and growls, this song manages at times to perfectly juxtapose an uplifting melodic tune with even more disparaging wails. Somehow, it works. "Eidolon" is an interesting song, opening with a calm, somber yet optimistic tune before transitioning to a heavier, distorted riff once again. Yet the song keeps the melodic undertones of the previous tune throughout. "Eidolon" breaks from the heavier distortion several times, reverting to the calmer clean guitar parts, doing a great job of keeping the listener's attention. Still remaining mid-paced, the album's title track sounds somewhat more aggressive and angry than those that preceded it. "Perspectives" follows - another short calming interlude - before the final behemoth of a near-instrumental song, "Veiled In Light." Clocking in at over seven and a half minutes long, "Veiled In Light" comes across as the album's epic song, switching often between heavier and clean, up-tempo parts. From the mid-point, the growling vocals are introduced, and the song starts a gradual build up of intensity, leaving the clean guitars behind entirely. The intensity seems to climax a couple of minutes before the song's end, only to restart and climax once more just before the end. The album is finally rounded out by "Reflections" - a somber piece that would seem a peaceful ending if it weren't for the wailing, far off in the background. I really enjoy well-executed instrumental post-rock, and Pelican has become a recent favorite of mine. However, one cannot not fault North's "What You Were" at all for having vocals. The vocals fit perfectly and give the album an entirely different feel. The end result is better than I could possibly have imagined and I look forward to North's future efforts, with or without vocals. It's a great blog - don't stop to post music, please :) And if you want to download anything, to your taste, you can find it here - http://forum.funkysouls.com/index.php?act=SF&f=37 , and here - http://post-metal.nnm.ru/. Enjoy !